Car won’t start? Jumping your own battery isn’t always the easiest task. What if you can’t get a hold of a second vehicle or the recharge battery may not be enough and a battery replacement is in order? At Affordable Auto, we are equipped with the knowledge, skills and tools to get you back on the road. It’s never fun to lock your keys in your car, luckily Affordable Auto is well trained and keeps up to date with auto locksmith services. Our number one job is customer satisfaction from small requests to more involved, major service situations, you can expect to receive the same high level of attention, accuracy and efficiency no matter the size of the job. Out of gas? Car won’t start? Need to tow your vehicle to a garage? 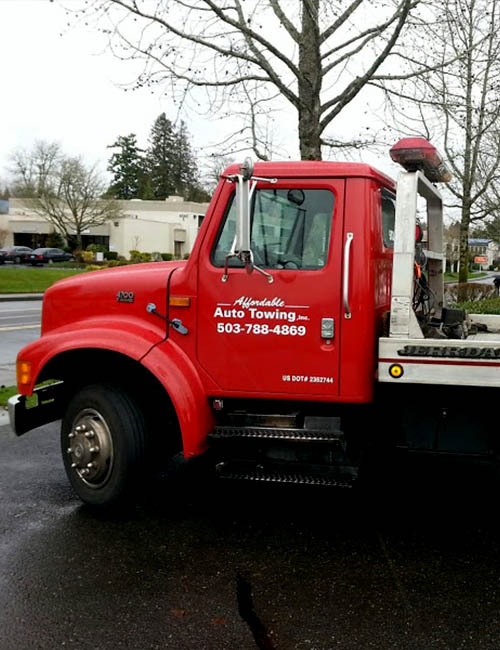 We are able to handle a wide variety of situations and can help you detect the issue, providing assistance and a helpful hand in all your Portland towing needs. Short tows within the Portland Metro Area shouldn’t cost an arm and a leg. Here at Affordable Auto, we keep our pricing honest with no hidden fees. You’ll pay the amount your quoted for the service you require and we ensure you are satisfied with that service. Not only do we want you happy with the service we provide, we want you to remember us next time you need tow service in Portland. All customers are treated like family and work is backed by our professional standard and personal guarantee. Visit us on Google+ and around the web for reviews from some of our happy customers. “My car problems started off with every male friend I know telling me what they thought was wrong with my car. While my car was still running I had it diagnosed but didn’t quite have the extra $200 to replace the starter right then and of course all my male friends had said, “oh what a easy fix, I can replace that in a hour and for half the price.” So three friends down and the last one standing six and a half hours later, I needn’t say more since I’m writing a tow truck review, right? So at this point arching the starter wasn’t working either, just for your info. So I have no AAA and now very limited cash flow thanx to my friends and dauntingly looking at all of the towing listings in the yellow pages, WOW! A precursor, I only need to tow my car 2.25 miles from my house and with the prices I was being quoted for just hooking my car up I was thinking I might just push it myself. I called about 8 places and they all wanted between $50-$80 just to hook-up the car to the tow truck. For actually moving the car most places wanted a minimum $30 and up charge for the first 3 miles. I was quoted anywhere from $80 to $125 to go the 2 miles I needed, utterly ridiculous. I called one last place that stated “AFFORDABLE AUTO TOWING” and to my amazement he wasn’t kidding. I can’t remember his name, but the man who answered was very polite, asked me where I was and where I needed to go and quoted me $55. I asked if that was just to hook me up and he said, “no that’s the whole charge $55 and I can be to your house in 30 minutes.” I was pleasantly surprised by the cost and especially when he showed up in 20 minutes with a FLATBED truck. He had me hooked up and ready to go in under 10 minutes and I was carefully towed to the “REAL MECHANIC” 15 minutes later.